Most search engines use the site’s <TITLE> tag as the link and main title of the site’s listing on the search results page. <TITLE> tags tell a browser what text to display in the browser’s title bar and are very important for search engines as well. Searchbots read page titles and use that information to determine what the pages are about. If your <TITLE> tags have a keyword between them that competing pages don’t have, you have a good chance of getting at or near the top of the search results. 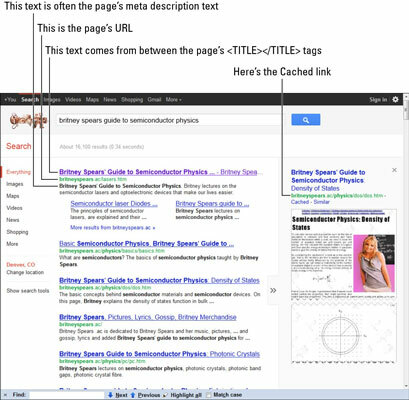 The <TITLE> tag is one of the most important components as far as search engines are concerned. However, these tags are usually wasted because few sites bother placing useful keywords in them. Titles are often generic: Welcome to Acme, Inc., or Acme Inc. – Home Page. Such titles are not beneficial for search engine optimization. Place your <TITLE> tags immediately below the <HEAD> tag. Place 40 to 60 characters between the <TITLE> and </TITLE> tags, including spaces. Put the keyword phrase you want to focus on for this page at the beginning of the <TITLE> tag. If you want, you can repeat the primary keywords once. Limit the number of two-letter words and very common words (known as stop words), such as as, the, and a, because search engines ignore them. Although the title tag is used as the link on the search-results page, it will be truncated if it’s too long. On Google, for instance, depending on spacing between words, the title may be truncated to around 55 to 65 characters and have an ellipsis (. . .) displayed at the end of the line — that is, Rodent Racing Info. Rats, Mice, Gerbils, Stoats, All Kinds of Rodent Racing may be displayed as Rodent Racing Info. Rats, Mice, Gerbils, Stoats, All Kinds of Rodent . . . . So make sure you get the important words that you want to be visible on the search-results page into those first 55 or so characters. Also, use title case (capitalizing the initial letter of each word, as in Rodent Racing Info. Rats, Mice, Gerbils, Stoats, All Kinds of Rodent Racing, not Rodent racing info. rats, mice, gerbils, stoats, all kinds of rodent racing). Title case is much easier for people to read as they scan down the page. The <TITLE> tag and often the DESCRIPTION tag appear on the search results page, so both these tags should encourage people to visit your site.